Comments: This image is an etching, by French printmaker Jacques Callot, showing a scene from La liberazione di Tirreno e d’Arnea, performed at the Uffizi palace, Florence. 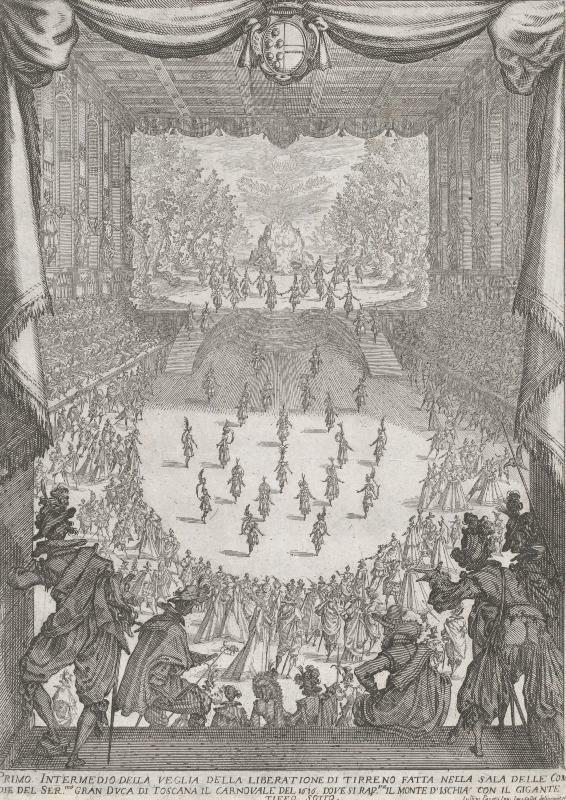 It was an intermedio (or intermezzo), a dance interlude performed in between dramas, with libretto by Andrea Salvadori and music by Marco da Gagliano, performed as part of a veglia (evening entertainment) to mark the marriage of Ferdinando Gonzaga, Duke of Mantua and Caterina de Medici in February 1617. The dancers at such performances were usually courtiers, same as the audience. Forty thousand persons, the largest gathering in the history of Southern California, saw the production of “Julius Caesar” in the natural amphitheater at Beach wood canyon, Hollywood. This estimate was made by officers of the Hollywood Carnival association, under whose auspices the production was given, today. It was estimated that $50,000 was derived from the sale of tickets. After the cost of the production is paid for the remainder of this sum will be turned over to the Actors’ Benefit Fund. The forty thousand persons reveled in a panorama of Shakespeare : such as probably never was seen in j America outside of the wonderfully beautiful Greek theater which nestles in the sun-rimmed Berkeley hills. As a spectacle they saw something far more wonderful, far more impressive, far more inspiring than their eyes had ever before been privileged to feast upon. They perceived at one heavenly glance the ultra of dramatic artistry and theatric wonderment. Confirmation was lacking, but the imagination necessarily does not have to be over-elastic to believe that the Avon bard, whose tercentennial the world is now celebrating, must have turned over in his flower and tribute bedecked grave and smiled with appreciative satisfaction as he visualized this wondrous triumph of brains and beauty. Had he himself lived to direct “Julius Caesar,” I doubt if the vast realism of it all would have been greater. Every seat in the huge open-air auditorium available to accommodate a human being was occupied; the hilltops to the east, to the west and to the north, wreathed in Stygean darkness held their quota of avid listeners, and hundreds crowded the entrance, disappointed at not being able to enter the gates. It was a notable event, one that will remain glued to the memory as long as Shakespearean drama lives—and that will be for always. The only disturbing regret protruding itself through the splendor of the occasion was the fact that the sponsors are unable to stage the performance another night, or for several nights, in order to make possible that more may witness it. But then we have the consoling promise of those generous-impulsed gentlemen that steps will be taken to make the festival an annual affair, with Hollywood giving its financial backing and Los Angeles its moral and artistic support. So much had been said of the plans for the production and the public hopes had been buoyed to so high a pitch that even the slightest flaw might have sent some, at the close of the performance, plodding down the mountain side crestfallen. But the management, the directors and the players kept faith with us and in place of disappointment we ambled through the myriad of wooden benches fully satisfied and content, yea, happy, that we had the foresight to procure a ticket. Not a flaw – I mean a serious one, for in all tremendous undertakings there are bound to creep little discrepancies—not a discordant note save for a rubble of voices coming from the unseated during the opening act, not an intrusion to mar the beauty injected itself so as to be prominently visible to the naked eye; everything ran as smoothly and perfectly as a freshly-pruned racing motor — the entrances, the exits, the complex lighting apparatus, the mob scenes, and last, but by no means least, the competent symphony orchestra of 75 pieces guided by a baton in the master hand of Wilbur Campbell. A stranger next to me expressed surprise that a thing of so gigantic size and multifarious important angles could be operated with so little confusion. His remark is an epitome of the opinion of 40,000 people. At no time and in no place since the history of man has a community had opportunity to sit through three hours of such delightful entertainment and view so rare and splendid a picture. To those on the outside its divine loveliness is unbelievable; certainly to us it was as though we were in a trance, or riding through a strange, wonderful land in a fairy chariot. It was an optical intoxication new to us. Here is what we saw in our fairy dream, only it wasn’t a dream at all. Directly in front of us lay a street of Rome, its beautiful Roman architecture glistening in the rays of powerful spotlights: on the right stood the Roman theater, revered in history and play; in the background to the extreme left and towering above the clouds circling the Capitollne hill, was the Homan capitol, within whose walls the mighty Caesar proclaimed his laws and received the tumultuous homage of his people. Winding snake-like from the street to the capitol ran a roadway which the king’s subjects ascended and descended at various junctures in the play. And as walls for the theater were the seven hills of Rome. Not the minutest particle of setting was theatrical in texture —all was the real, home-spun stuff built life-size and as near replicas of the originals as history would permit. No curtain drops with scenery painted thereon interjected themselves to destroy the illusion. Everything was real — and beautiful. And into this colorful setting paraded the pompous Caesar (Theodora Roberts), the conspirator Brutus (Tyrone Power), Marc Anthony (William Farnum), Cassius (Frank Keenan), Lucilius (Tully Marshall), Casca (De Wolf Hopper), Calpurnia (Constance Crawley), Cato (Douglas Fairbanks), Portia (Sarah Truax), Flavius (Wilbur Highy), Cleopatra (Grace Lord), and other well-known and respected citizens of old Rome, escorted by thousands of prettily costumed women and children and an impressive throng of male onlookers. The dancing girls were headed by dainty Mae Murray, Marjorie Riley and Capitola Holmes. This trio occupied the center of a picture that for grace and pulchritude and bewitching costumes is not often equaled. No small credit for the success of the production is due Raymond Wells and his corps of assistants for the superb handling of the cast and entire production. For one thing the performance revealed Mr. Wells’ extensive knowledge of Shakespearean works and his creative genius for giving expression to the same. There are many others to whom congratulations are not out of place, such men. for instance, as Charles A. Cooke, director general of the affair, and C.C. Craig, his chief aide, but they have reaped their reward in the appreciation that the production commanded from the spectators and the everlasting good will of the Actors’ Fund, in whose behalf the affair was staged. It was regrettable, indeed, that the early part of the play was unwarrantedly interrupted by late comers. They were compelled to crowd the entrance while the first scene was in progress, and, bring unable to procure seats, vented their anger by participating in a demonstration wholly ungentlemanly and unladylike, seriously hindering the performers and making it difficult for those seated to follow the threads of the play’s story. For this condition the management was equally to blame with the disturbers. Lax attention at the main entrance resulted in hundreds swarming into the amphitheater after the play’s progress had begun whereas had these late arrivals been held in leash until the first Intermission ho disagreeableness would have shown on the surface. Deeply grateful for Actors’ Fund and myself for the tremendous and magnificent action of all concerned in the production of Julius Caesar, for such a glowing tribute of affection and great service In the Interest of a worthy professional charity. Pres. Actors’ Fund of America. Comments: Guy Price was dramatic editor at the Los Angeles Herald. The production he describes of Julius Caesar was one of the most spectacular and extraordinary Shakespeare productions ever staged. 1916 was the tercentenary of Shakespeare’s death. Many events marking the tercentenary were held around the world. In Los Angeles, the Hollywood Businessmen’s Club decided to put on a spectacular stage production of Julius Caesar, at Beachwood Canyon, a natural amptitheatre in the Hollywood hills. For the major players in the case they invited members of the film industry, which had only recently started establishing studios in the Hollywood area. the film industry provided technical and production talent (including the director of the production Raymond Wells), stage properties (D.W. Griffith, Jesse Lasky, Thomas Ince, Mack Sennett and the Universal Film Corporation all contributed, while Gelenral Electric provided the lighting), and performers. Among the big name film and stage stars were Theodore Roberts (Julius Caesar), Tyrone Power Sr. (Brutus), Frank Keenan (Marc Antony), William Farnum (Cassius), Constance Crawley (Calpurnia), DeWolf Hopper (Casca), Douglas Fairbanks (Young Cato), Sarah Truax (Portia), Horace B. Carpenter (Decius Brutus), Gibson Gowland (Cinna), Tully Marshall (Lucilius) and Mae Murray (Barbaric Dancer). The remainder of the reported cast of 5,000 was made up of local residents and school students. The production was seen by 40,000 people, and featured vast visual spectacles including a gladiatorial arena and a re-enactment of the Battle of Philippi which commenced half a mile down the canyon before working its way up to the stage, lit all the way by magnesium flares. Roman sentries guided the audience to their seats. Music was supplied by a 75-piece orchestra. Profits of $2,500 went to the Actors’ Fund of America. Following the demands for a repeat production, a cut-down indoor production was staged at the Majestic Theatre, Los Angeles. Regrettably, only a single photograph of the set seems to survive to show something of the ambition of this one-off extravanganza, and despite the Hollywood involvement, it seems no one thought to film any of it. Text: “First nights” in Paris are a thing of the past. Paradoxical as this may seem it is actually true. For all the people who used to make up “first nights” audiences see the new plays at their répétition générale. Often two and even three of these functions are given before a new play is offered to the public — so that by the “first night” a play is stale. A répétition générale used to be called a dress rehearsal — and as is the custom all over Europe the critics were invited to witness the performance, but they were placed on their honor not to write about the play until after its formal “first night.” To-day, however, a répétition générale is not a rehearsal at all. It is the first public performance of a play — yet entirely different from a “first night.” It is a sort of trial trip for a special public, and has become the dressiest and most sought after function in twentieth century Paris. It is also above all things, for the stranger, a marvellous lesson in humbug. The theatrical world of Paris has learned how necessary humbug is in modern life, and the répétition générale is a very excellent object lesson in the knowledge. All who attend this function are the guests of the management. That is to say the manager, the author, and the members of the cast, the dressmakers, stage furnishers, scene-shifters, everybody who has anything to do with the production, has a right to invite a certain number of friends. This being so, the verdict of the répétition générale audience is the severest verdict which the play will ever get, and very often plays have been half-failures at this répétition générale, and boomed successfully for several hundred nights. For the general attitude is that of “I-dare-you-to-make-me-laugh.” People do not mind applauding so as to be polite, but so many people present are interested in the play business themselves, that comparatively few of them are very anxious for the play to be a success. Quite an instructive entertainment at a répétition générale in Paris is, after listening to the “Mais c’est charmant! Quel esprit! Que c’est délicieux!” and similar exclamations of delight, to wriggle out of the lighted stalls or balcony into the comparative darkness back in the corridors and listen to what the exclaimers whisper after they have exclaimed. It is also very interesting to hear the different opinions expressed by the same persons to their own friends and the friends of the author or the actor or the actress of whom they are talking. In fact, the more one goes with eyes and ears open to the répétition générale the more one becomes convinced of the fact that if Ananias and Sapphira had lived in our day they would have been immensely popular favorites in Paris. The iron door which separates the stage from the front of the house is always opened and left open after each act of the modern répétition générale, for two-thirds of the audience really has some right to go behind and congratulate the author, and the manager, and the actors, and the actresses, and the other third, which used to be refused admission, made such a noise about it that it became simpler and easier to let them all through. The principal business of each entr’acte is to embrace the author. How poor M. François de Curel suffered the evening I was there! It was the répétition générale of La Danse devant le Miroir at the Nouvel Ambigu theater. With most of the audience I went behind the scenes at the end of the second act to congratulate the author. What I saw would have resulted in several sudden deaths in an American playhouse. Forty or fifty highly excited, long-whiskered Frenchmen were shoving and pushing each other about in their frantic efforts to kiss the author. They kissed the back of his head, his ears; in fact, every available place. When they were through the women got a chance. They mobbed him on all sides and kissed him until his face was streaked with rouge and face powder, his glasses broken and his hair rumpled like that of a football player. I waited until the mob had left to attack M. Garry, the leading player, before I congratulated M. de Curel on his success. He was trying to wipe his mouth and cheeks with his handkerchief and when I only shook hands with him, and did not venture a kiss, he pressed my hand firmly and said “You are a real friend. Tell me, do you like the play? And do you think it will be a success? “My friend,” said M. de Curel, “at the répétition générale of my last play I was kissed by three times as many people and my play only ran two weeks.” And M. de Curel, let it be known, is considered one of the greatest dramatic authors of France. I must give a very brief outline of La danse devant le Miroir, it is so typically Parisian. American theatergoers will be interested in it because its leading feminine role is played by Mme. Simone, who tried so hard to establish herself as a star on our stage. Voila! Face to face with ruin, Paul Bréan throws himself into the Seine, rather than confess his love to Régine, whose fortune he is afraid he may appear to covet. But he is rescued from the river, and Régine offers him her hand. He refuses, and to establish between them a kind of equality, Régine makes him believe that she needs to be saved from dishonor. Out of devotion, he consents to give her his name. Then, learning he has been told a fairy-tale, he in turn plays a part: he pretends he still believes in her lapse. The result is a misunderstanding that is prolonged right up to the wedding night. Régine would like to ascertain whether Bréan is really a hero lover, or, on the contrary, merely a low speculator decked out with the mask of a knight, and Bréan, to quell her perplexities, shoots himself while she is embracing him. However, Robert de Flers and M.F. Duquesnel, two of the leading critics in Paris, said it was very fine and Edmond See, another critic, added his word of praise. But Paris is a long way from New York. I was told that some years ago the répétition générale was a real dress rehearsal. There were never to be more than thirty critics and other folk whose business was the stage, and they were expected to come back to the first night. If anything went at all wrong, it was done over again and rehearsals used to be over at three or half past in the morning. Nowadays the dressmakers, a few critics, and a few friends manage to fill the house at the rehearsal which is called the dressmakers’ and photographers’ rehearsal, but they do not appear in evening dress. The real dress rehearsal is now two or three days before the show. By the first night the play is stale. Comments: Karl Kingsley Kitchen (1885-1935) was an American travel writer, newspaper columnist and bon viveur. François, Vicomte de Curel (1854-1928) was a French playwright. 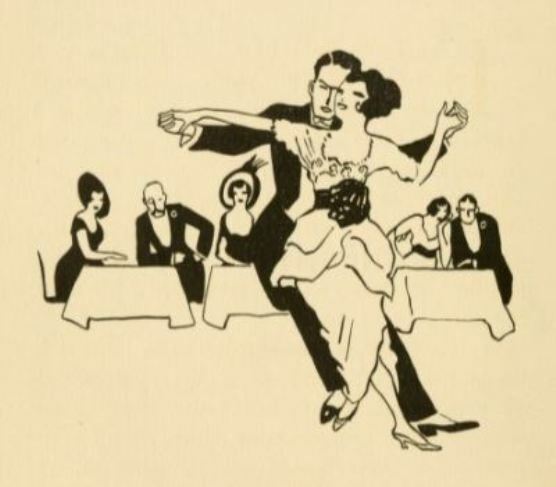 His play La danse devant le miroir had its premiere at the Théâtre de l’Ambigu-Comique, Paris on 17 January 1914. The actors mentioned are Claude Garry and Simone Le Bargy, known as Madame Simone.